And now it's time to get back to some more Asian dishes. Pan-fried noodles are one of my favorite dishes at Cantonese restaurants, and I made this a couple of weeks ago when I needed to used up some (more) leftovers from hot pot as well as some broccoli from a Boston Organics delivery. I was really surprised at how easy it was; the hardest part was going to the Asian grocery store and finding the fresh Hong Kong style egg noodles. You could probably try making these with fresh or cooked semolina or non-Hong Kong style egg noodles, but the results won't be the same. The thin Hong Kong style egg noodles allow you pan-fry them while fresh so that they get crispy and cooked through without needing to boil them first, and they serve as the perfect medium for absorbing the gravy as well. Other than the noodles, you can probably substitute any other meats and veggies you want: shrimp, beef, pork, chicken, squid, or baby corn, straw mushrooms, snow peas, baby bok choy, Chinese broccoli, etc. Add oil to a heated pan. Add noodles. 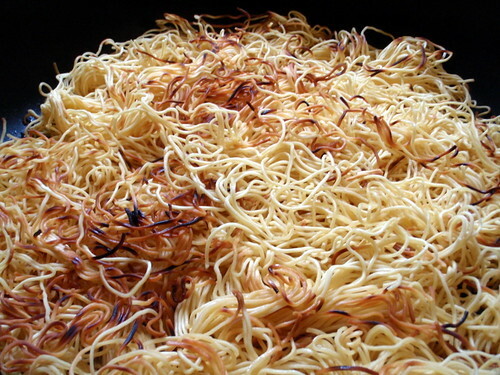 The noodles should brown very quickly. Use a pair of chopsticks or a spatula to make sure the noodles are getting browned evenly. If you need to, use the spatula to press the noodles against the pan or add some more cooking oil to make sure you brown most of the noodles. Plate the noodles and set aside. Mix together the ingredients for the marinade and add the sliced chicken. Set aside. In a separate bowl, combine the ingredients for the sauce. In a smaller bowl, combine corn starch and water. Set aside. Add oil to a heated pan and saute garlic and broccoli for about 3 minutes or until garlic is starting to turn brown. Add a half cup of water and cover to let the broccoli finish cooking by steaming. After 5 minutes, remove cover and check to see if the broccoli is done. Salt to taste and dish out. Add oil to a heated pan and cook onions, mushrooms, and chicken until done. Add broccoli back to the pan. Stir well. Add the sauce mixture. Bring it to a boil. Add the corn starch mixture and give a quick stir. Bring it to a boil. Pour gravy on top of the noodles. Serve immediately! 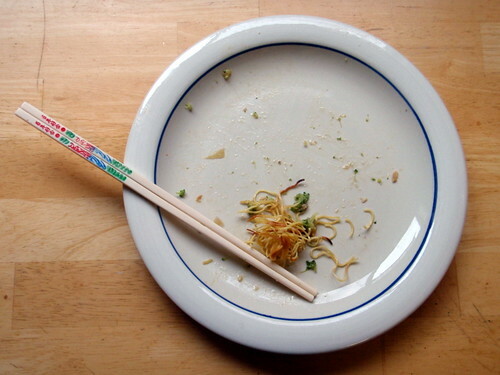 I'm definitely one of those "save the best for last" type eaters, so I almost always have a little bit of the crunchy noodles left at the end. Yum! First of all, thanks for this and the other great recipes! Can you please tell me, what kind(brand) of soy sauce you use(dark and light one)? Do you use a different one for, let's say jiao zi? Thank you very much! Simon - Actually, I'm not really picky about the kind of soy sauce I'm using. Sometimes it's Kikkoman, and sometime's it's Chinese aged soy sauce. I just made this last night, and it was amazing. I used thinly sliced firm tofu instead of chicken and even my tofu-phobic boyfriend didn't mind at all. Thank you! I am a fellow Cantabrigian who laments the recent closure of Lucky Garden. Sorry, I never had the pleasure of eating at Lucky Garden so I'm not sure how this would compare. I thought this did taste pretty similar to what I get at most Chinese restaurants, so maybe it'll be similar! For those of you in the area. and lot of other asain stuff. I had pan fried noodles today and I HAD to come home and google it. Could you tell me, did you boil the egg noodles first before frying it in the pan, or did you fry it directly after opening the noodles package? I used fresh noodles (found in the refrigerated section), so they did not need to be boiled first. Oh, this is EXACTLY what I've been craving! Yum! I'm going to see if I can find some noodles like this tomorrow! Such a good recipe. We are vegetarians so I used a mushroom based oyster sauce and doubled the sauce. 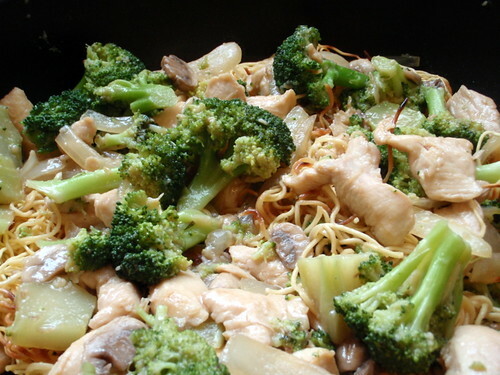 I left out chicken and used loads of broccoli, cabbage, mushrooms, and baby corn ears. Rally solid and perfect recipe. Tastes like they make at our local Cantonese spot.